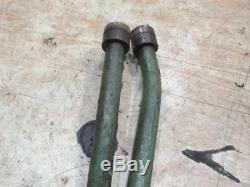 John Deere 720 730 Remote Hydraulic Lines Tubes John Deere parts numbers AF2997R and AF2998R For all 720 730 tractors, diesel and non diesel. These are the lines that go around the front of the rockshaft, to the couplers on the left side. The lines are in solid and useable condition. They are pretty straight, with no large bends or dents to them. The threads for the coupler hoses are nice. The ends that go into the hydraulic box are clean and rust free. The lines do not have any repairs or breaks. The lines do have pitting but are solid. 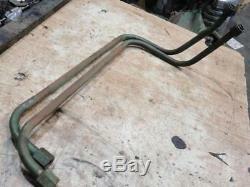 John Deere 720 730 Remote Hydraulic Lines Tubes. 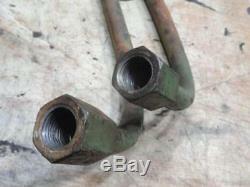 John Deere parts numbers AF2997R and AF2998R For all 720 730 tractors, diesel and non diesel. The ends that go into the hydraulic box. Are clean and rust free. Parts Inquiries and General Questions Welcomed! Styled A B G 50 60 70 520 530 620 630 720 730. ALL INVENTORY IS NOT LISTED ONLINE PLEASE CALL. Be sure to add me to your favorites list. Get images that make Supersized seem small. The item "John Deere 720 730 Remote Hydraulic Lines Tubes AF2997R and AF2998R" is in sale since Tuesday, November 27, 2018. This item is in the category "Business & Industrial\Heavy Equipment, Parts & Attachments\Heavy Equipment Parts & Accessories\Antique & Vintage Equipment Parts". The seller is "millertractoron480th" and is located in Kalona, Iowa.